Some thoughts around community sets and the pyramid of community involvement. When we talk about Fedora, we mean the last one. When you talk with a member of Red Hat’s Community Architecture team, when we say community, we mean the ones who contribute to improve the technology at the core of the community. The community that contributes to improve the technology is the one that defines the technology and the next generation of users, advocates, and enablers. One way to view this is that we are focusing on the community that is the superset for all other community focuses. Focusing on improving and growing contributors translates to improvements in the technology, which benefit and grow all the other communities. Without the contributor community, all the other communities atrophy and die. People who have communities that focus on growing belonging amongst users and advocates are very important and useful. In Fedora, Fedora Ambassadors is one such group, doing outreach directly to end-users via online and in-person activities, advocating for Fedora and free software the world over. Yet, it is only part of an overall focus on contributors and contributions. As important as all that work is, when a community is only focused on, for example, end users and advocates, that community has self-chosen it’s own limitations. It cannot get to the point of actually directing that technology, thereby making a better and longer lasting improvement for their users, advocates, and so on. In the end, when you focus on the tip of the pyramid, on the contributors, you are making a bet on the team most likely to take the technology in a direction meaningful beyond their hands. 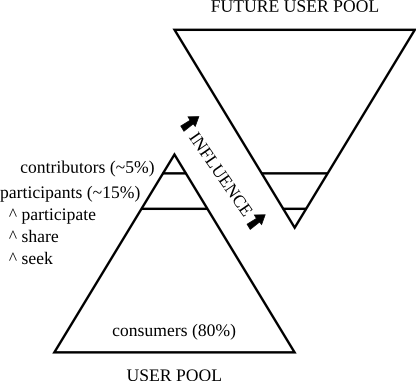 In the community contribution pyramid, the contributors in the current user pool have the greatest influence on the entirety of the future user pool. A sign of a good open source project is a healthy focus on the contributors, and the participants who are the source pool for future contributors. Comments closed — Trackbacks closed RSS 2.0 feed for these comments This entry (permalink) was posted on Tuesday, April 14, 2009, at 10:36 am by quaid. Filed in Business, Fedora, FLOSS, Leadership, Open Source, Red Hat. An example of a takeaway from the participation pyramid: by focusing infrastructure efforts on enabling contributors and participants, you distribute the keys to the kingdom that enable them to help grow more users, participants, and contributors.